In the category of strongest animals, the list would be incomplete without including the Blue Whale. The Blue whale is a massive animal and is the strongest animal on earth. Their habitat is far and wide; where there are oceans, there are Blue whales. When ocean changes affect the availability of their diet of krill, they migrate. One interesting facts is that scientists who have studied adaptations of whales believe they use to live on land and are related to the hippo. For more information about why this baleen whale species is so interesting, take a look at the facts below written for both kids and adults. Click here for a great selection of Amazon.com books about Blue Whales. Blue whales top the list of strongest animals because of the enormous muscle strength required for this animal to survive. The power and strength it takes for the blue whale to simply open its mouth and take in krill makes it incredibly powerful. Blue whales are warm-blooded mammals who breathe in air and although they can hold their breath for 20 minutes or longer, they must eventually return to the surface of the water for air. 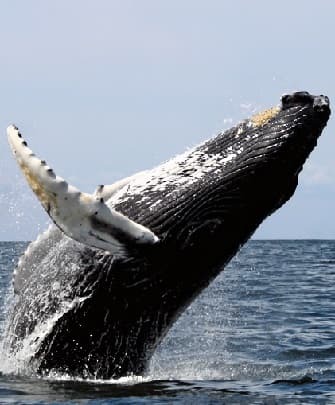 The blowhole, where the blue whale breathes in air, is located at the top of the head and is opened when the whale uses a muscle to open the flap of skin covering the opening. The blue whales are known as baleen whales because of their lack of teeth. Instead they have a series of plates made of the same material as human fingernails (keratin). They are spaced in such a way that they act as a sieve. They take in water and krill; the water is pushed out while the krill are locked inside and swallowed. The blue whale eats up to 5 tons (4536 Kilograms) of krill per day. Ironically, krill are one of the smallest animals in the world at just 1-2 centimeters (.39 - .78) inches each. Blue whales are long living animals who do not reach their full size until about 50 years of age. Blue whales do sleep but only with one half of their brain at a time. Blue whales have many adaptations from their early land dwelling ancestors for living in the water. They no longer have hair on their bodies but are insulted with a thick layer of blubber instead. Their nose has become a blowhole on the top of their head. Since their sense of hearing is so important, their low-frequency hearing has become particularly well-developed. The blue whales size is massive. Reaching up to 110 feet long (33 meters). They are larger than the largest dinosaur that ever existed. They can weigh up to 200 tons (181,437 kilograms). Their mouths, when fully open, can take in their own body mass in water, approximately 90 tons (81,647 kilograms). That means that another blue whale could potentially fit inside the opening of their mouth. Their tongues alone can weigh as much as an average adult elephant. Each flipper (pectoral fin) is about the length of one human adult. Both the blowhole and the arteries of the blue whale are large enough to fit a baby through. The heart of the blue whale is approximately 1,300 pounds (600 kg); that is about the size of a small car. It is no wonder that baby blue whales are the largest baby animals, weighing in at approximately four tons (3628 kg) at birth or the equivalent of two large cars. Only one baby is born at a time to a mother blue whale. Blue whale babies spend almost one year inside the mother's womb before entering the world. They grow at a rate of about 200 pounds (91 kilograms) per day.